Don and Cathy Jo's Continuing Adventures on the Waterways of Europe with the Dutch Barge "Oldtimer"
We were on the final push to get Oldtimer ready for the winter but that didn’t prevent us from having a little fun. One day after our chores were complete we drove down to Genelard on the Canal Lateral a la Loire. 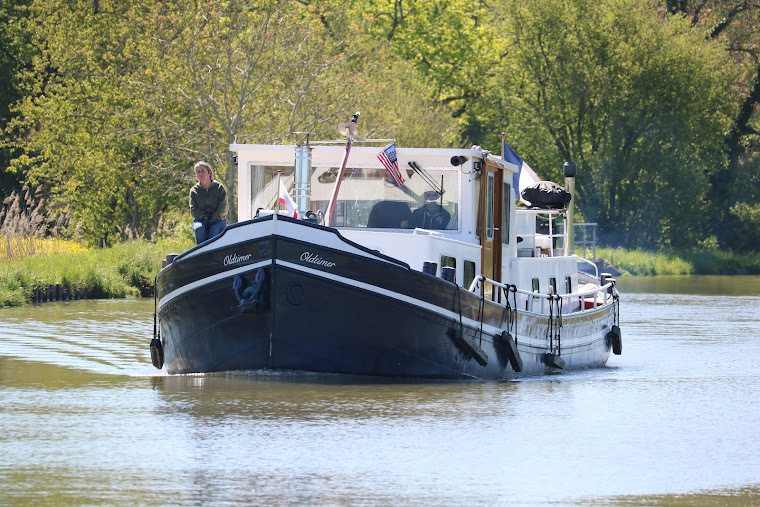 Carmen, of Beauregard fame earlier in the summer on the Canal du Nivernais, had finally been joined by her husband Roger. We wanted to meet the mystery man so we took off one afternoon and joined them for a glass of wine (or two) and an apertif. Mostly it was chores: cleaning, more cleaning, laundry, changing engine fluids and filters and more cleaning. By Sunday, all was complete. 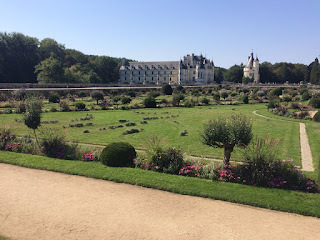 It was off to the Hotel du Rivage in Gien for the night, followed on Monday by a train ride to Paris and the RER to the area around Charles de Gaulle Airport. 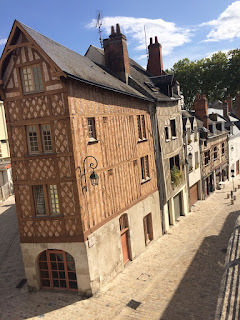 We had booked a night at a hotel in the nearby village of Roissy that was on the shuttle line to and from the airport. We assume many airport workers live in the village which features several giant generic hotels and lots of small restaurants. We had a stroll around the very pleasant town and a nice meal in the evening. Tuesday morning it was off to the airport for the flight home; this time the train and plane travel going off without a hitch, in contrast to our trip over in April. By Tuesday afternoon we were on the ground again on the freeway back to Ventura, another season complete. 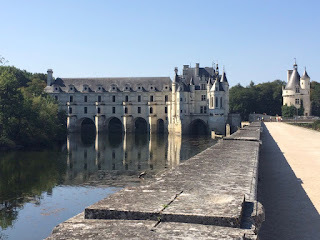 A next day we set off for a visit to a very different chateau, Chenonceau. 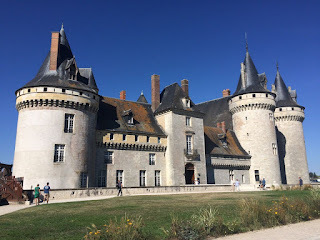 It wasn’t until we were doing a little research after our visit that we discovered it’s the second most visited chateau in France after Versailles. 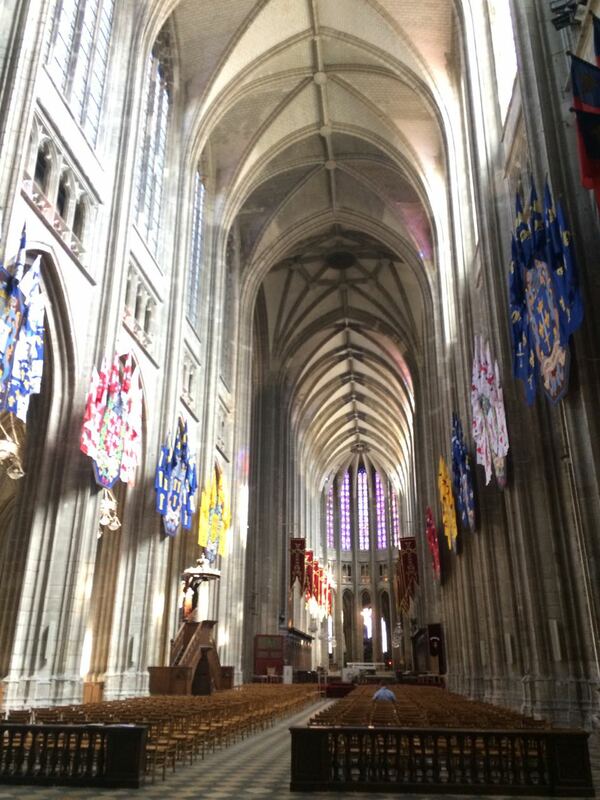 The castle has a fascinating history revolving around the women responsible for its construction and expansion. Originally built in the 13th century by the Marques family, the castle was rebuilt in the 14th after it was burnt. 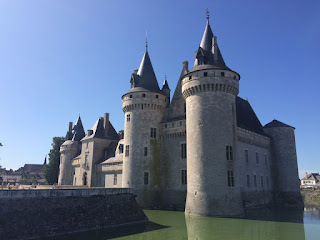 Debts caused the chateau to be sold to Thomas Bohier, Chamberlain to King Charles VIII in 1513. Bohier’s wife, Katherine Briçonnet, oversaw construction of an almost entirely new castle between 1515 and 1521. In 1535 the castle was seized from Bohier’s son for unpaid debts to the king. In 1547 after the death of Francis I, the new king, Henry II, gave the castle to his mistress, Dianne de Poitiers. She greatly expanded the buildings and constructed extensive flower and vegetable gardens. After Henry died in 1559, his strong-willed widow and regent Catherine d' Medici forced Diane to exchange it for another. Queen Catherine then made Chenonceau her own favorite residence, adding a new series of gardens. As Regent of France, Catherine spent a fortune on the château and hosted spectacular parties. In 1560, the first ever fireworks display seen in France took place during the celebrations marking the ascension to the throne of Catherine's son Francis II. 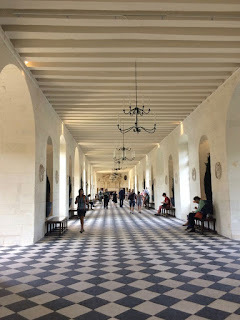 The grand gallery, which extended along the existing bridge to cross the entire river (that’s to the left in the above picture), was dedicated in 1577. Later owners included Gabrielle d'Estrées, Louise Dupin and Marguerite Pelouse, whose work on the castle exhausted her finances and forced her to give it up in 1881. In 1913, the château was acquired by Henri Menier, a member of the Menier family, famous for their chocolates, who still own it today. During World War I Gastin Menier set up the gallery to be used as a hospital ward. It doesn’t look much like a hospital ward now! During the Second World War the château, with it’s gallery, was a means of escaping from the Nazi Occupied Zone. The hallway went from one side of the River Cher (the Nazi side) to the "free" zone on the opposite bank. In 1951, the Menier family entrusted the château's restoration to Bernard Voisin, who brought the dilapidated structure and the gardens (ravaged in The Cher River flood in 1940) back to its former glory. 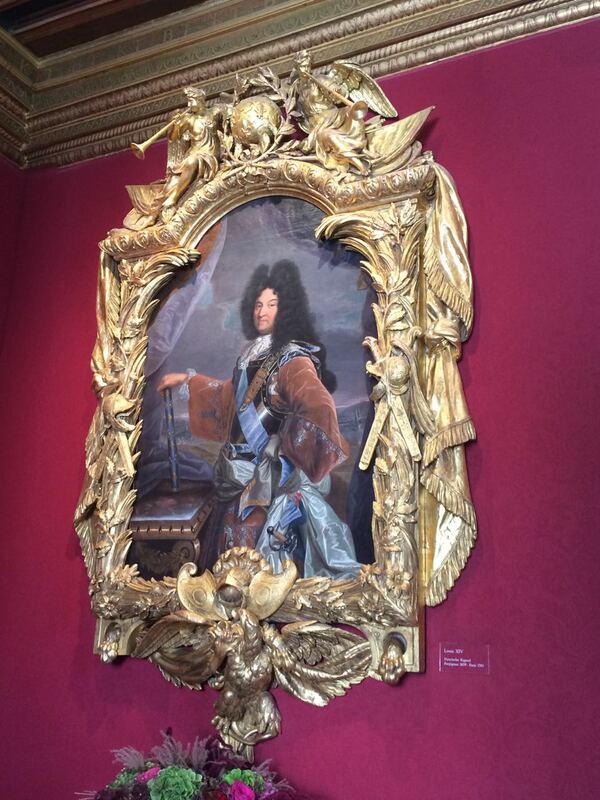 Louis XIV, the Sun King. Amazing frame, amazing hair! After the afternoon at the chateau, it was back to the boat for the final preparations for it’s long winter sleep. 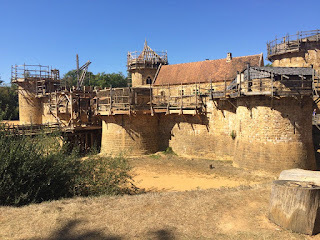 In the many seasons we’ve spent around this area we’ve seen the tourist information brochures for Guédelon but never managed to visit. It’s not really close to the water so not accessible from the canals by bike but it’s only about 45 mins from Briare by car so this year we thought we’d pay a visit. And the folks from Hibou had told us it was very worth the trip. It was a beautiful day for our visit. There was much activity and lots of visitors. at the base of the tower where they’re building the roof. When completed, this will be the entrance gate with a bridge over the “moat”. 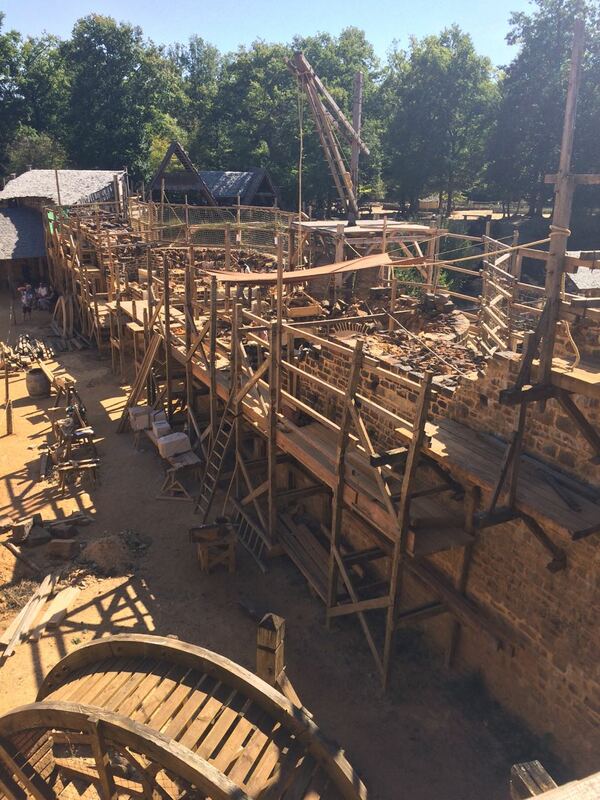 All of that scaffolding is constructed locally by hand; no power tools. The entrance gate from the outside. During our visit we saw workers dressing stone blocks and decorative touches, making bricks from clay and straw, cutting roofing shakes from local oak logs and making clay roof tiles, tending the horses used to pull the carts full of construction materials, making rope from locally grown fibers and ate a delicious lunch complete with bread made in the wood-fired oven. In theory, construction is supposed to be complete sometime in the early 2020’s. We plan to come back to watch the project progress. It’s fascinating! 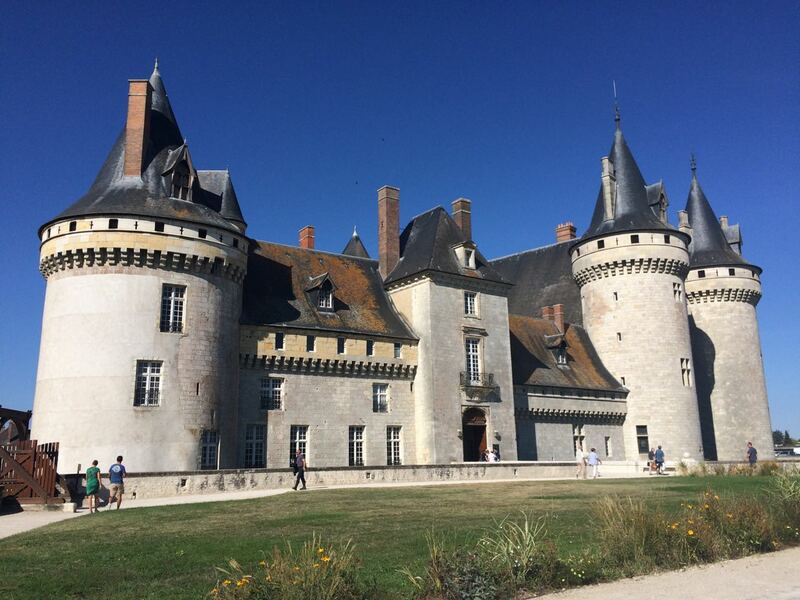 With our time in France coming close to an end for this year we had one more chateau to visit. Chenonceau. 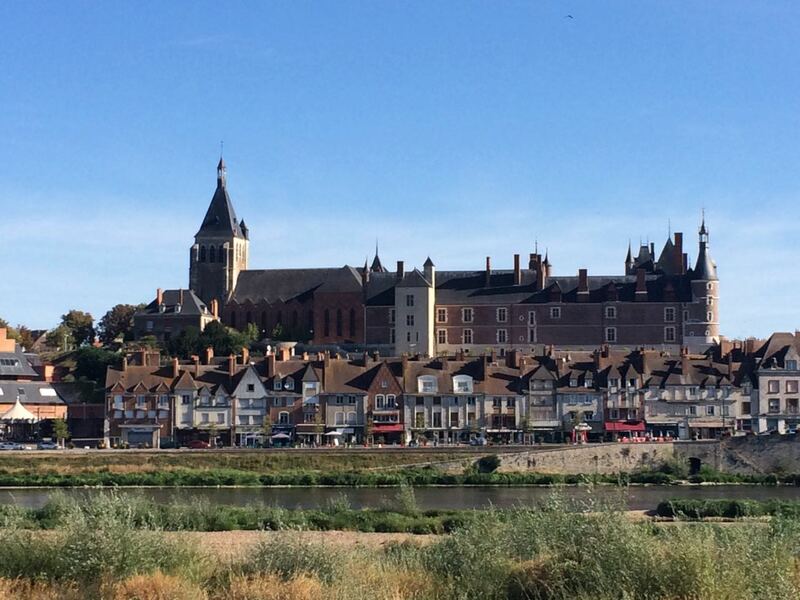 Friday afternoon we took the 15 minute train ride to the neighboring town of Gien. That’s where the rental car agency is that would provide us with transportation for the next 10 days. After we picked up the car we made a beeline for the Faiencerie Gien, a famous pottery manufacturer. They have an outlet store and we thought maybe we could find a deal. Turns out the deals weren’t enough to cause us to part with our hard earned euros so we returned to the boat, continuing our end-of-season chores. Laundry must be done, oil and filters must be changed and things packed away for the long dark winter months. 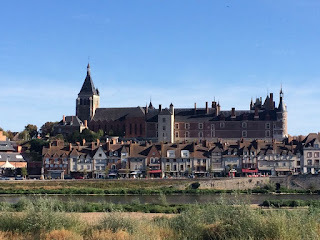 Sunday we set off again, heading down along the Loire River, back through Gien. In the middle ages the town of Gien-le-Vieux (Old Gien) became a parish when Saint Peregrine, bishop of Auxerre, founded the Church of St. Peter and St. Paul. In the eighth century, Charlemagne authorized the construction of a fortified mound around the site of the present castle (château). In the ninth and tenth centuries the decline of the Carolingian empire and Viking raids led to a gradual abandonment of Gien-le-Vieux. The population mostly moved to the site of the current town of Gien which was easier to defend. 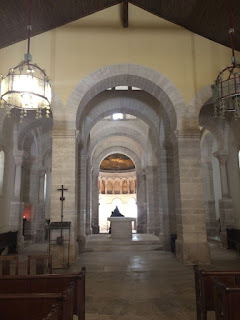 However, the church of St. Peter and St. Paul survived until the seventeenth century. 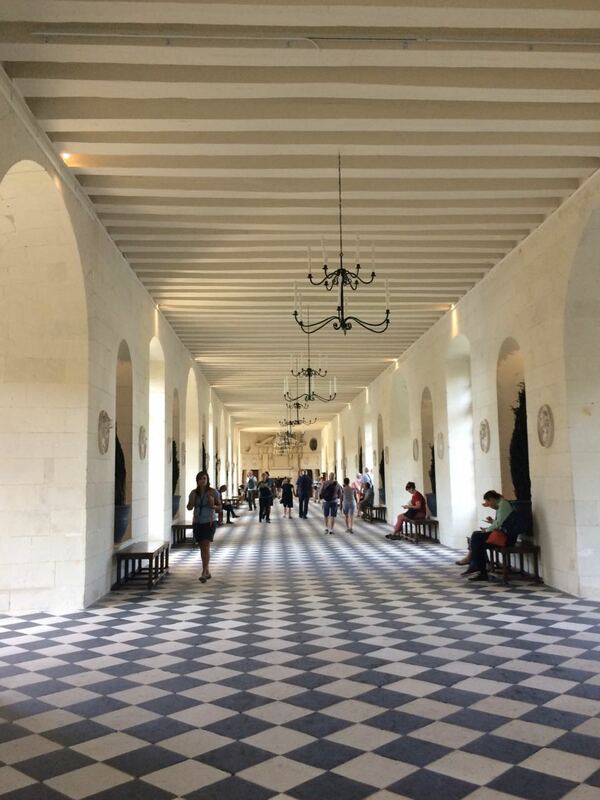 Gien had a large Protestant community during the French Religious wars and like its neighbors, Châtillon-Coligny, Châtillon-sur-Loire and Orleans, it was a Protestant stronghold. 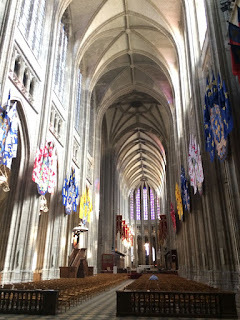 The churches were looted and clergy hunted. Much of Gien was destroyed during the World War 2. The town was bombed by the Luftwaffe, who aimed to destroy the town's bridge over the river to prevent the French Army from retreating. The bombardment created a huge fire which destroyed over four hundred buildings, including the town's two main churches. The town was rebuilt after the war. The Chateau de Gien and Église Sainte-Jeanne-d’Arc loom over the city and the river. Our next stop was the Chateau Sully. 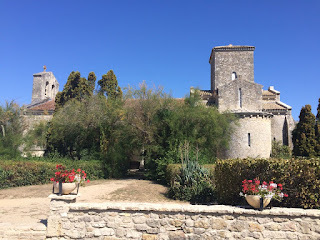 We had planned to take a tour of the castle but when we arrived there was a huge Fête de la Sange taking place. We think it had something to do with hunting (sang is blood) but the place was crawling with people and the parking was a nightmare. We wandered around for a few minutes and took a couple of pictures and then beat a hasty retreat. If you follow the link above there’s lots more information on the castle as well as a video tour. Well worth a look! Further west along the river, our next stop was Germigny-des-Prés to see an ancient oratory, or small chapel. Built in 806 by Theodolf, the Bishop of Orleans and private counsellor to Charlemagne, it is all that remains of his villa. The interior is beautiful, very simple and peaceful. 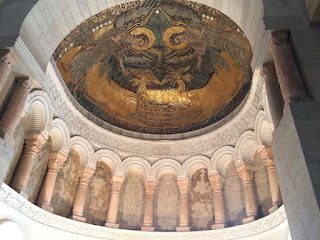 In the 19th century, during one of the many reconstruction efforts a mosaic from the 900’s, covered in whitewash and depicting the Arc of the Covenant, was discovered in the western apse. Created by a Byzantine artist, it is made up of over 130,000 broken glass bricks. Next we were off to Orléans. A statue entitled I Die Through You. The monument is near the north transept of the cathedral. 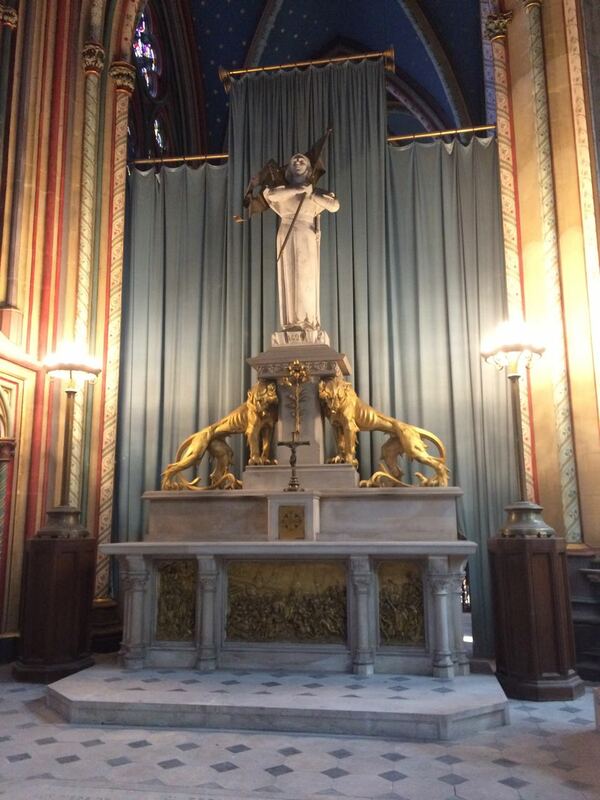 It was erected at the time of Joan of Arc's beatification in 1909 and canonization in 1920. The city was having it’s fall fair where all of the cultural institutions and other clubs sign residents up for winter activities and distribute schedules. We heard performances by the city orchestra and a group of pipers. The model railroad club was there as were several youth sports leagues. 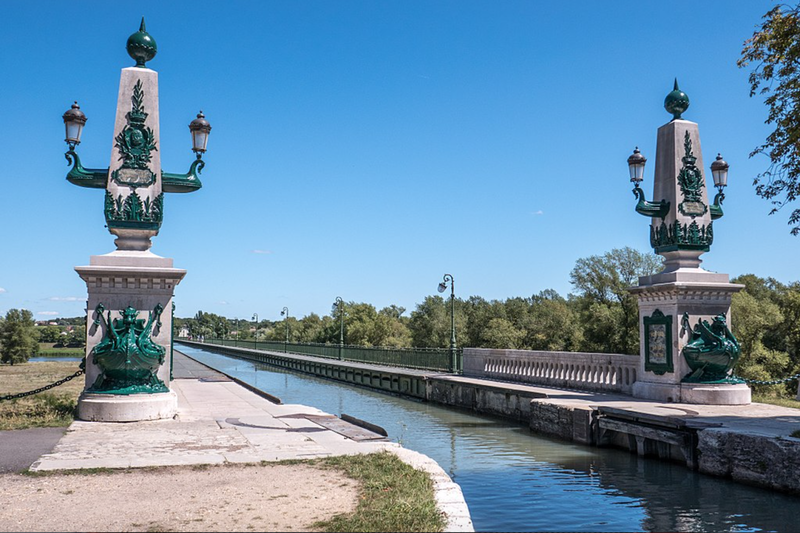 Since it was pretty late in the day and we had over an hour’s drive to get back to the boat, we didn’t stay long but we lamented that the Canal d’Orléans is closed. We would have loved to visit here for several days by boat. 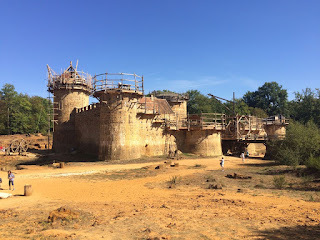 In a couple of days our next excursion would take us to a château under construction. Here’s the map of the travels for the year. The “parking” icons between Nancy and Strasbourg are the places we stopped on our return trip. As before, if you click on the frame in the upper right corner you get a bigger map that you can zoom on to get a close view of the area we traveled. 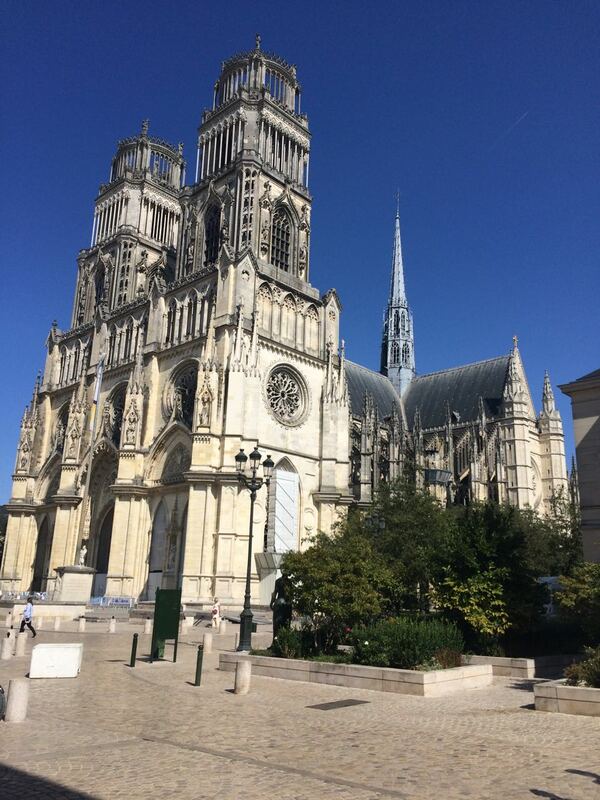 Still to come - chateaus and cathedrals: traveling the Valley of the Loire by car. Dammarie sur Loing turned out to be as advertised. We arrived a little after noon on Sunday to find a grassy bank with bollards just outside of the village with free water and power. The only possible drawback was that it appeared the dirt towpath was being converted into a paved bicycle trail. Some digging had gone on and there was construction equipment scattered around. Painting would not happen if they were going to be digging up the bank. Luckily one of the workers happened by and told us the work wouldn’t begin in earnest for another week. Not entirely true as it turned out but it wasn’t enough to cause us any problems. We broke out the sanders, vacuum cleaner and paint supplies and got to work. By Tuesday we had a coat of paint on the exterior of the front cabin and the varnish was all touched up. Since stays are supposed to be limited to 2 days and we were at a good stopping point we figured we’d move on. Besides, there was rain in the forecast for the next couple of days. 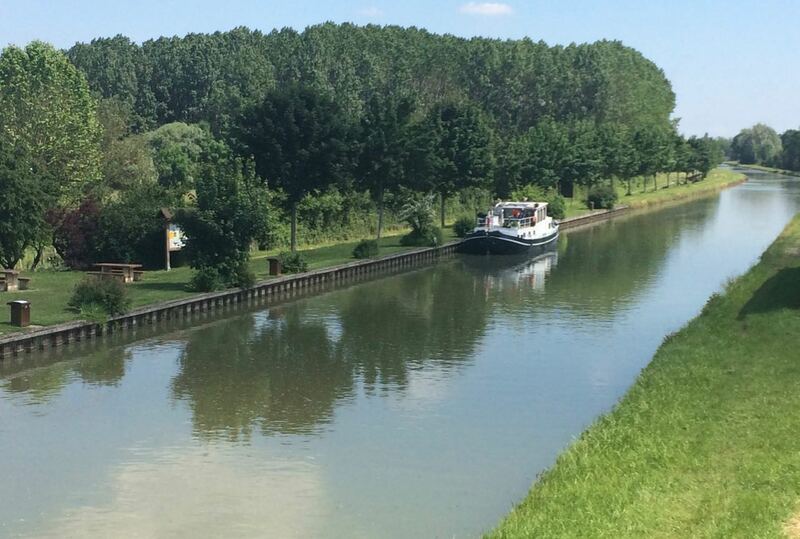 Wednesday morning we set out for Ouzouer sur Trézée, 15 k down the canal. 4 k along we passed through the village of Rogny les Sept Écluses, one of the wonders of the canal. 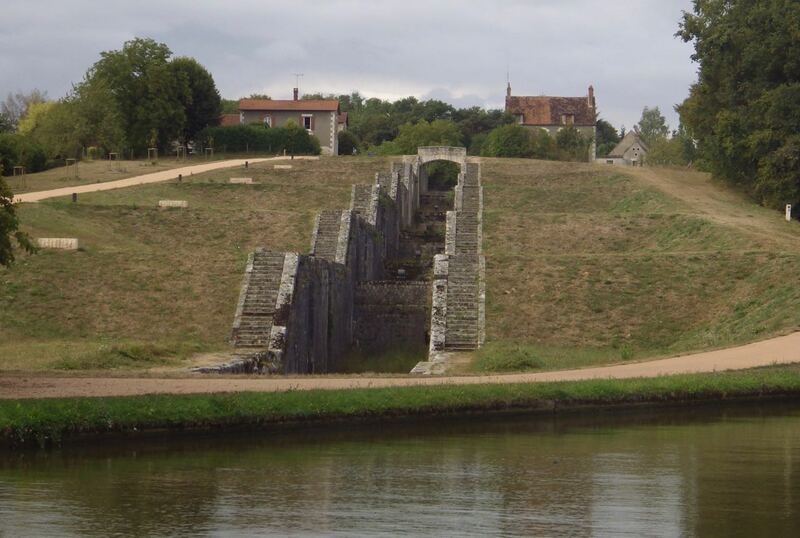 When originally built, the canal climbed out the the Loing Valley to the valley of the Trézée River by a seven chamber lock staircase. Now, the canal passes around the hill the structure climbed with six conventional locks and pounds but the remains of the staircase are still there. The doors are gone but the lock walls are still in place. By 2 o’clock we had reached Ouzouer to find a very pleasant mooring in a park with the usual services and Guy and Jane on Hibou whom we’d met on the Nivernais. They were going in the opposite direction from us when we left Clamecy so we closed the circle. The rain clouds are gathering. Ouzouer is just a small village but very proud of their flowers. We’d really like to hear the story of this structure! Wandering about the village during the day we saw what we thought was a pizza restaurant and since we hadn’t had a pie in awhile, decided to have a meal out. When we showed up at the place at dinner time, however, it turned out the restaurant wasn’t fully operational yet (no restroom facilities) so they were takeout only. We ordered our pizza and took it back to the boat. We had a better wine selection anyway. Thursday morning we were off to our final stop for the year and more painting. After we visited Briare to drop off Ines for her taxi ride to Paris in The Flood Year (2016), we spent the next night at Beaulieu. Another long grassy bank with water and power outside a village. Time for more painting. 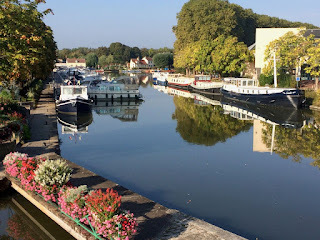 The bonus was that it was just a couple of hours past Briare on the Canal Lateral a la Loire. Also, just a five minute bike ride down the road was a pick-your-own vegetable farm. We could have the fresh haricourt verts we’d been missing all summer. 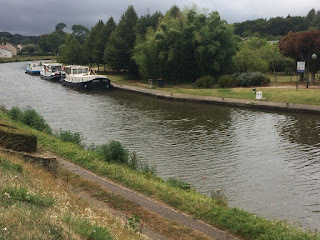 The Beaulieu mooring in 2016. On that road to the vegetables was a big poster advertising a Concours de Peche, a fishing contest, that would feature a friture lunch. Friture is a pile of little freshwater fish, like smelt, fried up an served with frites. Along with a glass of wine, it sounded like a great €10 lunch. We cycled off to the contest with another couple we had met at the moorings, bought our tickets and stood in line. When we got to the front, however, the last of the friture went to the people in front of us. Foiled! Apparently there were many more people for lunch than last year and they hadn’t bought enough fish. There was plenty of wine and potatoes, though, so we bought some frites and a bottle of the local rosé to drown our sorrows and cycled back to the boat for a pity lunch. By Monday afternoon we’d managed to complete our painting tasks so Tuesday the 4th we headed back across the pont canal over the Loire and onto the branch canal that leads into the Briare marina. By 1:30 in the afternoon we were secured in our winter moorings. 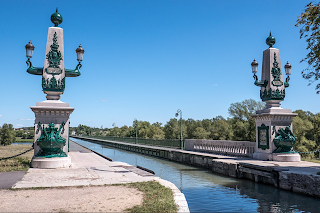 The entrance to the Pont Canal from it’s Wikipedia page. Oldtimer in her winter home. 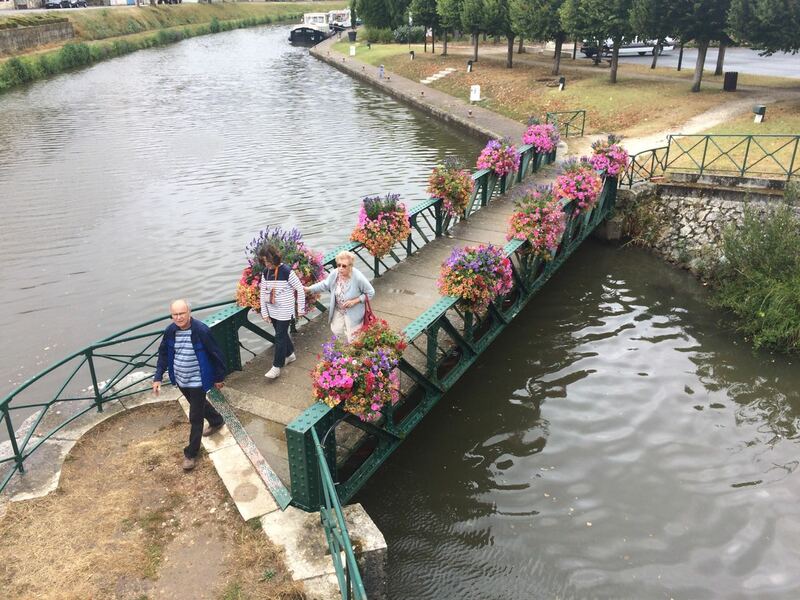 Briare is a "3 Flower" town. Our flight back to the US wasn’t until the 18th so we had plenty of time to complete our end-of-season chores and do a little touring around the area by car. We pulled into the moorings at Chatillon-Coligny close to 3 pm on Friday. A nice mooring with a long quay and several finger pontoons; there was plenty of room and water and electricity were provided. There was a notice that we were supposed to check in with the capitanerie/tourist office upon our arrival so we wandered up, wallets in hand. We were asked to provide the name of the boat and our nationality and then wished a “bonne journee.” No charge! 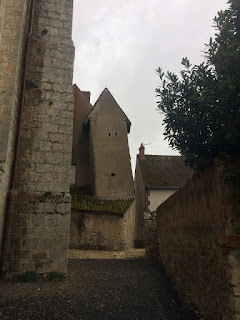 We had been clued into a good restaurant by other bargees so we walked in to town to find Le Coligny and make a reservation for Saturday lunch. That task accomplished we headed into the heart of town. There were flyers in the tourist office for the Fete Insensé that was scheduled to take place on Saturday. We weren’t sure what that was all about since insensé translates as “mad” or “foolish” but we wanted to see what town looked like before madness took over. What we found was a pretty typical small French village in the Gâtanais. The bell tower tops the old city wall near the church St. Pierre-St. Paul. 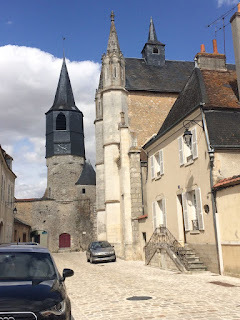 On Saturday after our delicious lunch at the moderately fancy Le Coligny we headed into town for the Fete. Booths with all sorts of masseuses, aroma therapy consultants, aura readers and the like were set up around the center of town. One storefront held a make-your-own-music workshop with, shall we say, eccentric instruments (we spent a few minutes banging on things). In the evening there was the usual food and drink and music, of a sort. We think maybe they gave the local high school garage bands time for a couple of songs on the stage. We could only take so much of that before we had to retreat to the boat. Sunday morning we made a trek to the grocery store. We had our eye on a mooring just 6 k away that was outside a village but had free water and electricity. The weather was supposed to be reasonable and those painting jobs were calling. We wanted to get started. Enter your email, you'll get the posts! Jenny and Adrian on "Piedaleau"
David and Evey on "L'Escapade"
Tom and Carol on "Vivante"